An informal networking event for all Students and Staff in The School of Engineering in WIT. 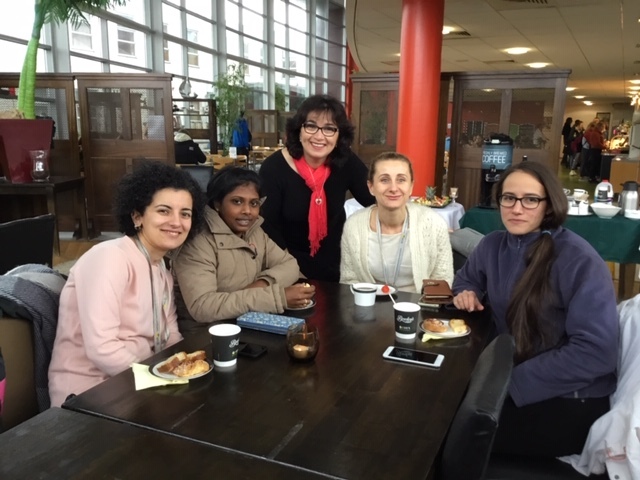 The School of Engineering Ladies Coffee Morning was held in two locations recently. This very popular event took place in the Gallery in the main Cork Road Campus for the Engineering students and staff, and in the Parlour Vintage Tea Rooms in Waterford city centre for the Architecture staff and students that are based in the Granary Campus. Over 20 female students from the Department of Architecture, from the BSc in Architecture, BSc Architectural BIM Technology and BSc Architectural Technology, together with Departmental staff enjoyed delightful scones and tea and coffee all served on vintage china with accompanying 1920s jazz music in the Parlour Vintage Tea Rooms. A further 20 enjoyed the event in the Gallery in WIT’s Cork Road campus. Students and staff from the Electrical, Electronic, Sustainable Energy, Civil and Mechanical & Manufacturing Engineering programmes gathered together. SEAM (South Eastern Applied Material) research centre staff joined in also. The event was thoroughly enjoyed by all who attended and it was a wonderful for female staff and students to come together in celebration of women in the School of Engineering at WIT.